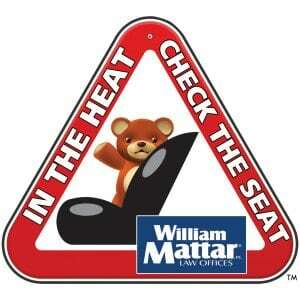 William Mattar Law Offices is focused on raising awareness of infant and animal deaths from heat stroke after being left or forgotten in vehicles. That’s why we created our “In the Heat, Check the Seat” decals. Place the decal where it is visible while exiting your vehicle, such as on your dashboard, console, driver side door, or lower left window corner. It’s a simple reminder that can potentially save a precious little life. Together, let’s help keep our children and pets safe. **Our program for 2018 has concluded. We will launch the 2019 program in late spring. In the meantime, when the temperature outside rises be mindful of your vehicle temp inside. In the Heat, Check the Seat! If children or animals are left in these conditions for even a few minutes, they can suffer from hypothermia, brain damage, and possible death. Join truck accident injury attorney William Mattar to make a change. Spread awareness by keeping this reminder on your vehicle. Doing so could help save your child’s life—or someone else’s.